These clear and comprehensive lead guitar lessons will give you the skills and confidence you need to create those spine tingling solos we all love. Simply start at the top and work through the lessons in the order they're presented, following the path to becoming a more confident and dynamic lead player. Skillful lead isn't about playing as fast as possible, although speed and timing are important soloing elements. Lead is primarily about personal expression, as though you're speaking through the guitar. Don't get too caught up in the notes-per-second race. Speed will come naturally. The lead guitar techniques below can be seen as the physical application of notes and scales on the fretboard. So the two go hand in hand (see the scales section in the top menu). The idea is to equip yourself with a number of ways of getting from one note to the next in your solo - bend, tap, string skip, hammer on, slide etc. 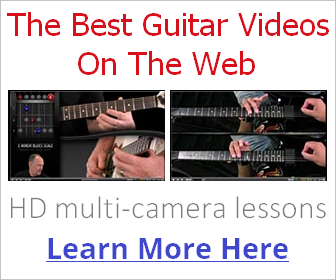 Open String Lead Video showing you some ideas for using open strings in your lead playing. Pedal Point Pedal pont is a technique that involves alternating between a fixed or re-articulated note and other notes. A great way to develop several core lead skills in one go. This lesson will get you up to speed with some basic exercises. String Bending String bending really does liven up boring, flat solos, and every lead guitarist should be confident with using bends. Learn to bend with ease and precision with this two part series with video. Part 1 introduces the physical basics, before we move on to more specific bending techniques in further parts (below). Vibrato An essential technique for punctuating your lead phrases. On guitar, vibrato is applied using a form of repeating, pulsing string bend. This lesson (with video) shows you the basic technique, essential exercises and some different ways of applying vibrato. Legato On guitar, legato simply refers to playing without picking. This is acheived predominantly through the use of hammer ons and pulls offs. In these lessons I'll introduce the basic hammer on and pull off techniques, provide exercises to get all your fingers involved and finally look at combining the two. Chromatic Approach A simple way of using hammer-ons, slides and bending to inject feeling and emotion into your lead playing. Once you've learned those core techniques above, this lesson will show you how to apply them to scales and licks. Arpeggio Technique Different ways you can physically play arpeggios, including alternate picking, string skipping, rolling, legato, sweep picking and tapping. Using the techniques in this lesson will help you play arpeggios faster. Octave Lead Explores Octaves and how to incorporate them into your playing. If you've just learned your scales, they are a great way to branch out from the "practicing scales" sound to something more melodic. Octaves are also helpful to memorizing the fretboard. Sweep Picking This video series will give you a solid introduction to sweep picking, including right hand/left hand syncronisation and sweeping some basic arpeggio patterns. Note that you can find a library of patterns for sweep picking in the arpeggios series. Metronomes help you keep time during your practise drills, allowing you to speed up gradually as your confidence improves. 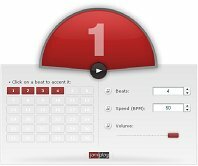 I strongly recommend using a metronome for every lead technique you learn. Get into the habit now! A great program that provides you with hundreds of speed building exercises and drills covering warming up, bending, alternate picking, string skipping, tapping and more. Includes backing tracks, tuner and metronome. 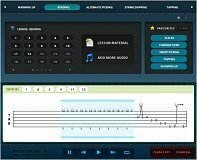 All the tools you need for lead guitar practice in one place.